FROME nurse, Jude Curtis,who has worked for the NHS for 40 years, is retiring this year after serving Frome as a community nurse and nurse practitioner for the past 20 years. Jude said, “I first began my training to become a general nurse at the age of 18, in London. I started as a general nurse but my main role has been in district nursing, predominately in Frome for 20 years, where I worked as a team leader and loved it. “Frome Medical Practice then offered me a promotion to nurse practitioner where I also do a lot of GPs’ home visits to take away the bulk and pressure from them. “To help, I am also an independent prescriber which is a quick responsive service that allows me to prescribe medications to people in their home. “My main interest of work is in palliative care, helping those who need extra support at the end of their lives, to keep them at home rather than needing to come to the hospital. “Working for the NHS is very fulfilling, but challenging and definitely active. It’s a busy world working for the NHS – more so now than at any other point in my career. “I am a strong advocate of health care for everyone, so I am very proud of the NHS and we are very lucky to have such a service in the UK. I have never worked outside of the NHS and couldn’t be happier. “The medical practice is such a lovely working environment. My colleagues are so supportive, we have such fun and they are a great team to have. It will be a big wrench to leave them when I retire. “I have lots of plans for my retirement, it will give me more time to be more active in the local community groups that I am a member of, and I want to take up some volunteering roles. “Sadly my father is very ill, so it would mean that I can spend more time caring for him. More positively, I can finally get another dalmation puppy! They are very outdoor, energetic breeds of dog and i’m excited to take them out where I live, on the Salisbury plain, to go cycling and running with them alongside me. 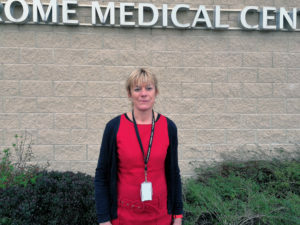 Dr Helen Kingston, senior partner at Frome Medical Practice said, “For over 40 years Jude has shone in her career as a nurse. She has been a loyal and highly capable team member both as a district nurse and then as employee of our practice at Frome Medical Practice where she performs a vital role as an advanced nurse practitioner undertaking home visit to individuals. Dr Tom Cahill, partner at Frome Medical Practice added, “She helps patients die with minimal symptoms and maximum dignity in their own home and she is very supportive of relatives. “She is also a wonderful supportive colleague. This is one person I would definitely go into the jungle with! She always brings a solution for a problem; she has a great sense of humour and is lots of fun. She has a pragmatic no-nonsense approach to work and life. She has battled cancer herself and won.